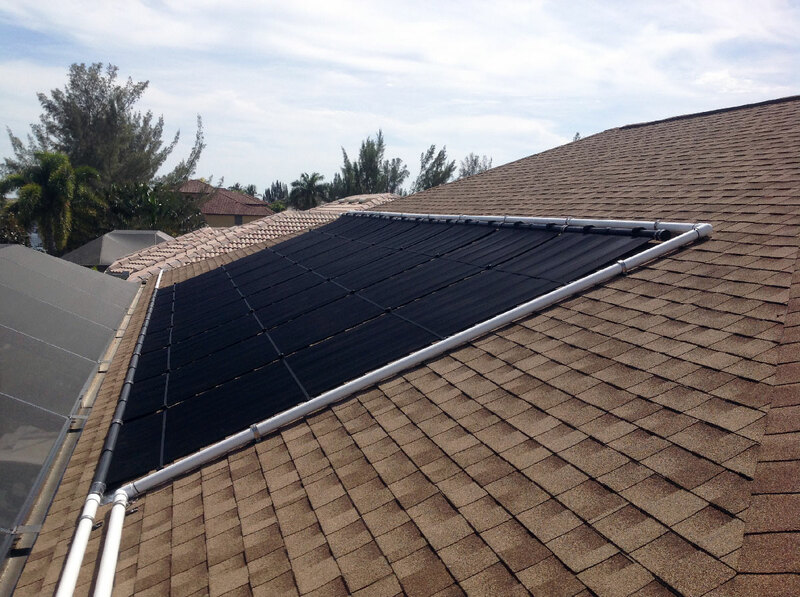 It is pretty common for a solar pool heater to wrap around to an adjacent roof when there is not enough space on one roof surface to get the needed coverage. Plumbing connects the two banks together as if it is a single system on one roof. As long as the height of each bank of panels is the same, the plumbing is quite simple. 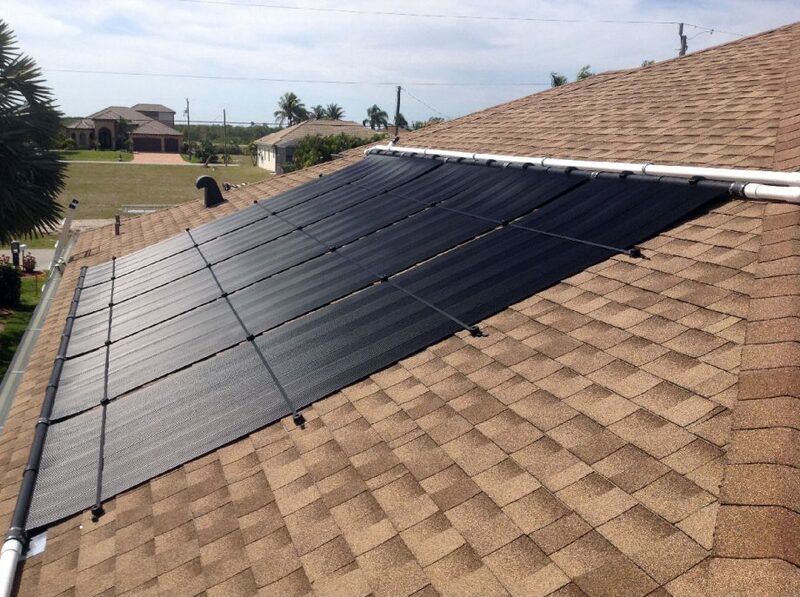 Here is a recent Cape Coral, FL installation on two roofs with a total of 13 solar panels. I recently have been looking into solar options for around the house and this is one of the most sleekest designs I have seen as far as pool heating goes. I love how uniform it looks with the natural roof and how you keep everything simple. Nothing flashy and very clean cut right here. No mess. How do you determine how many panels you will need? I would have thought that one panel per pool would have been just fine and as long as you have the sun baking things away, you are good to go. We have an article on how many panels it takes to heat a pool. Absolutely not saying this is wrong just want to understand. In your design you connect both the top and bottom banks together, Is there a reason that the exit of the first bank of panels does not feed the 2nd bank inlet? Also with panels on 2 roof faces is there not a concern for water to get trapped in the most remote 2nd bank in this case? You don’t want to run solar pool heating panels in series as you suggest for the same reason you don’t run ALL of the panels in series. If you preheat water, each subsequent panel will perform with less efficiency. You want parallel operation of all panels (ideally, even flow through each). Solar pool heating relies on the concept of Delta T – the difference between the water temperature and the surface temperature of the panel. A higher difference (Delta) results in more heat transfer. Incidentally, this is why a solar heater is always plumbing in before an electric or gas heater. You would not want to send already-heated water to the solar panels because they would work less efficiently, or perhaps even cool preheated water. As for water getting trapped in the second bank of panels, the water will not be trapped there. This is exactly why we use an opposite end feed and return plumbing arrangement. If we feed and return water from the same side of the array, most water would flow through the closest panel(s). Little water would flow through the most distant panels. In manifold design (a solar pool heater is essentially a big manifold), that is an important concept for evening flow. There is an acceptable difference in flow rate that will not result in much efficiency loss. If the array of panels is exceptionally large, a center feed is possible, or parallel balanced operation of different banks. For typical residential systems, opposite end feed and return works great at typical pool flow rates.